I’d like to keep my cat inside, but she was a stray that I rescued and I can’t keep her in. She howls and/or waits by the door. What should I do? My cat has never brought any animals home. Is there any reason to think he harms wildlife? Do bells on the collar stop cats from killing wildlife? Does declawing prevent cats from killing wildlife? What about all the stray cats in my area? They live outside, so what difference does it make whether I let my cat out? My cat may catch wildlife, but he will be unhappy if I keep him inside. Why is it better for my cat to suffer than for a wild animal to suffer? Isn’t it cruel to keep cats inside if they want to be outside? But aren’t cats more “wild” than other pets? My cat mostly brings home mice. Don’t outdoor cats keep populations of pest animals in check? Do cats that are well fed and cared for still kill wildlife? My cat doesn’t kill wildlife—he/she just catches and plays with them and lets them go. If they can run/fly away, aren’t they OK? Can my cat catch any diseases from being outside? Are there safe ways to let my cat enjoy the outdoors? How can I convert my outdoor cat to an indoor cat? When a cat is used to being outside it will take some adjustments to keep her indoors at first. The cat may sit at the door and cry to be let outside, or slip out if the door is held open for a few seconds too long. As long as they think they can succeed, cats will keep at these tactics diligently. Introducing a new routine to your cat will require diligence on your part as well. At first you will have to be careful whenever you open the door, and you may need to be patient with your cat’s frustration at the change. It is a normal part of the adjustment to indoor life, and it is temporary. As long as you are consistent and give your cat lots of affection and things to do during the transition, she will adjust. During this period you can take comfort in the fact that you are giving your cat a much greater chance of a long, healthy, and happy life. For owners who are in a position to consider them, options such as protected outdoor enclosures or harness training provide an opportunity to keep pets and wildlife safe while still allowing your cat some outdoor time. Owners are not aware of the many animals killed by their outdoor cats. Many studies looking at predation by cats measure “kills” by counting the bones, fur, and feathers of other animals in the cat’s feces. These studies have found animal remains in the feces of cats whose owners have never seen their cat attack or bring home an animal. The hunting instinct is strong in cats, and even those that seem laid back may catch animals that they encounter outside. No. Studies have shown that belled cats are just as efficient at catching wildlife as cats without bells. Many cats can learn to stalk their prey silently, and there is also no evidence that wild animals associate the ringing of a bell with danger. Additionally, many baby animals – who are most vulnerable to cat predation – have no means of escaping even if they hear a cat coming. Babies still confined to a nest, for example, or young birds who cannot yet fly, would be hard-pressed to escape a cat. Studies have shown that declawed cats are still successful at catching and killing wildlife. Declawing is also, in our view, a dubious procedure. Declawing is not like trimming a cat’s nails; it involves actually amputating the bone at the end of each digit. Declawing inflicts physical (and very likely psychological) damage on the cat, does not prevent outdoor cats from catching wildlife, and leaves cats with fewer resources to defend themselves from the predators they themselves encounter. Many European countries have outlawed the practice, deeming it inhumane and unnecessary ”mutilation.” North America has not yet followed suit, but there is little evidence to suggest that declawing has any real benefits that cannot be achieved in other ways. The primary reason for declawing is to avoid damage to furniture. Check out tips from HSUS on addressing this behavioural issue. Roaming outside unsupervised isn’t good for any cat, whether it’s someone’s pet or not. Every free-roaming outdoor cat is at risk of illness, injury, and even death, as are the wild animals that cats prey upon. There are two kinds of “homeless” cats. Stray cats, which are cats who were previously owned but have become homeless through escape or abandonment by their caregivers. And feral cats, who were born and have lived their entire lives outdoors. Stray cats tend to be (or can become, with a little kindness) human-friendly. They usually can, and should be, captured and adopted to a new home. While some government animal organizations will assist with finding homes for stray cats, this task is often done by people who find the cats and are sympathetic to their plight, or by non-profit cat rescue organizations. If you find a stray in need of a home, please consider getting involved. Life in the wild is difficult for them; many suffer terrible illnesses and injuries, and many do not survive. Feral cats are those born outdoors to a free-roaming cat, or those lost or abandoned as kittens. They have never or rarely been socialized with humans, and are usually very nervous of people. Some feral cats have been somewhat “tamed” through repeated exposure to people, but adopting these cats as house pets is not always a realistic possibility. There are several possible options for feral cats, though there is controversy over which ones are both feasible and acceptable. In our opinion, the best possible option for both cats and wildlife is to maintain feral cat colonies in large protected outdoor enclosures, where spayed and neutered feral cats can live and receive care without being in danger from cars and predators, and without posing a threat to wildlife. TTVAR (trap-test-vaccinate-alter-release) programs are also commonly employed to minimize disease and prevent at least some uncontrolled breeding within feral cat colonies, with the goal of reducing the colony’s population over time. It isn’t. The problem with outdoor cats catching wildlife is that even animals that escape from a cat after they are caught nearly always die from complications afterward. The consequences the animals face are not equal. Cats kept indoors may be temporarily restless or frustrated while adjusting to the change, but the animals they catch outdoors must pay with their lives. In our view, the unrestricted freedom of one animal is not worth the lives of potentially many other animals. Some studies say outdoor cats kill as many as 100 animals per year. It is important to remember that this is not a part of a functional food chain within an ecosystem. Additionally, cats may also suffer negative effects on their own health from going outside, so allowing cats to roam outdoors brings potential suffering to both cats and the animals they catch. If your cat is used to being outside, it will take some adjustment to keep him indoors at first. The cat may sit at the door and howl to be let outside, or other new behaviours such as furniture scratching or urinating outside the litter box may occur. It may feel cruel to listen to your cat meowing and not open the door, however it endangers the health and life of both your cat and wildlife to allow the cat outside. Most people would consider it irresponsible pet ownership to allow their pet dog or rabbit to run freely through the neighbourhood unsupervised, and cats are no different—they too are at risk of becoming lost, harmed, or of harming other animals. It is certainly true that many cats enjoy the opportunity for exercise and fresh air. If it is within your means and abilities to do so, consider installing an outdoor cat enclosure for your cat. These marvellous enclosures are the best of both worlds, allowing cats to play outside by keeping them and wildlife safe from harm. A less expensive, but more time consuming option is to train cats to go outside on a leash and harness. No. Like all other domestic animals, cats descend from a wild ancestor, but the process of domestication began thousands of years ago. In that time, both the species and its environment has changed. Cats may seem independent, but they rely on humans either directly or indirectly for survival (in areas where no people live, there are no domestic cat populations). All wild animals have a specific place in their ecosystems, where predators and prey maintain a delicate balance. It is natural within these systems for animals to kill and consume one another. However, cats no longer occupy a place in wild ecosystems. The effect of them taking wild prey, particularly when one thinks of the millions of outdoor cats in North America alone, is extremely destructive to these sensitive systems. It affects prey populations directly, and predator populations by limiting the availability of prey. And when you consider predation from cats is the result of an instinct that isn’t usually necessary for the cat’s survival (even well fed cats will still hunt), the loss of the wild animals they catch seems even more tragic. Cats do kill a lot of common species. It is a frequently held belief that cats are doing a beneficial thing in reducing the numbers of “pest” species, but the real picture is more complex than this. Even common species play an integral role in the ecosystems of which they are a part. Let’s look at one example. Deer mice are a common rodent in Ontario, in both rural and urban areas. Many predators rely upon deer mice as a main source of food, including foxes, snakes, and birds of prey. It s a fact that owl pellets can contain up to 40% deer mice bones! When deer mice populations are affected by hunting cats – a non-native predator who has not evolved as a part of wild ecosystems – the wild predators that normally prey on deer mice are not able to find enough food, and their populations then also decline. The life cycles of the plants that deer mice normally eat are also affected. The death of one animal may seem insignificant, but there is a lot happening under the radar. The introduction of an outside influence, such as cats, is enough to throw the sensitive dynamics of this whole system off balance. Cats also kill many uncommon species. In fact, there are some sensitive species whose populations in specific geographical areas have been nearly wiped out by hunting cats. Ontario is home to 62 mammal, bird, reptile and amphibian species listed as endangered, threatened, or of special concern. When individual animals in these species groups are lost, Ontario’s rich biodiversity is threatened. Seventeen of the species admitted to Toronto Wildlife Centre, a rehabilitation centre serving mostly urban and residential areas, are listed as species at risk. Any factor which contributes to mortality in these species groups increases the chances of that species becoming permanently extinct. The Committee on the Status of Endangered Wildlife in Canada (COSEWIC) has recognized outdoor cats and other introduced species as a threat to wildlife, both through their role as predators and because introduced species compete with native wildlife for food resources and habitat. Yes. Even with influence of domestication, cats have retained their instinct to hunt. This urge is not directly connected to hunger. Well fed cats kill as much as hungry cats do and, as many cat owners can attest, a lot of cats play with and don’t actually eat the animals they catch. Most animals caught by cats die, even if they appear to have escaped unharmed. Some of the damage to animals captured by cats is difficult to see (i.e. internal hemorrhaging, punctured air sacs, etc.). Cats also carry bacteria on their teeth and claws that are extremely harmful to other animals. A tiny cat inflicted puncture wound, even one that produces no blood, can cause a serious infection in the animal who receives it. The affected animal can die from this infection within 72 hours, and often less, if left untreated. Adult humans have died from infection resulting from a cat bite. An animal who has been picked up or pawed by a cat needs medical attention. Contact a wildlife rehabilitator right away if you have encountered a wild animal who has had contact with a cat, even if the animal appears healthy. Yes. Through contact with other cats and wildlife, outdoor cats are often exposed to devastating diseases such as Feline Leukemia Virus (FeLV), Feline Immunodeficiency Virus (FIV), Feline Infectious Peritonitis, Rabies, Feline Distemper, and various infectious respiratory viruses. In addition, outdoor cats are vulnerable to both internal parasites (e.g.,. worms) and external parasites (e.g., fleas, ticks), some of which can be transmitted to other pets and people as well as causing discomfort and potential harm to the cat. Yes! There are many creative designs for outdoor cat enclosures. Pet cats can safely enjoy the outdoors by eliminating their risk of harm from vehicles, other animals or humans, poisons, and other unknowns. 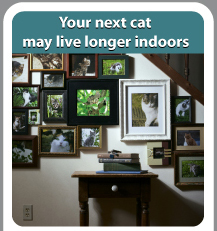 This also limits the danger outdoor cats present for wildlife. Cat enclosures can be purchased pre-made (as assembly kits), or custom designed for your cat and your home by a number of different companies. In Ontario, we recommend Habitat Haven if you would like to purchase a cat run. Many cat owners have also purchased building materials and built cat runs themselves. Cats also can be trained to go outside on a leash and harness, especially if this routine is established while the cat is still young. This way, your cat can be outside when you are there to supervise. Cat harnesses are available for purchase at many pet stores. Check out tips from the OSPCA on harness training. Most cats, even those who have spent a lot of time outdoors, can transition to indoor life as long as you take care to give them lots of attention and things to do. This is especially true during the adjustment period. Cats require stimulation, and one of the most frequent problems with adjusting to indoor life is boredom. Provide your cat with interactive, interesting toys; feathers or fabric on a string attached to a pole, paper bags, lightweight balls are great fun for cats. Spend time playing with your cat every day, and make sure she has posts or other textured areas to scratch on and a clean litter pan. Check out our tips on keeping cats happy indoors.